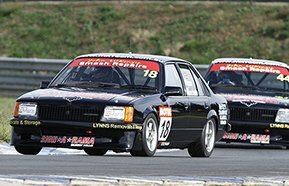 Round 2 of the NSW Motor Race Championship held at Wakefield Park on April 28/29, was another successful race meeting for MRTeam. Once again the professionalism of our team impressed all who saw us including raceway officials and event organisers. We decided against purchasing new tyres for the weekend and chose to run with the same tyres from Round 1, as suspension upgrades would commence the following week to run the new Yokohama 050 tyres. Luckily the weather was in our favour and Ryan and Reece drove really well, making the most of what they had. We ran close to our targets even though the tyres were getting quite worn. Ryan qualified in 12th position out of a field of 20, with Reece right behind him in 13th position. In a similar fashion to Round 1 at Eastern Creek, both Ryan and Reece made up ground in their first race out. Reece was quick to take the lead from his brother, working his way into 9th position which he held for the remainder of the race. Ryan worked his way down to 10th position which he defensively held for the majority of the race until he came in too hot on turn 10. Ryan came off the track in a controlled drift and finished the race in 14th position. Again similarly to Round 1 at Eastern Creek, the tables turned in Race 2 with Ryan finishing in 9th position, while Reece had an off road experience of his own. Reece had worked his way in to 8th position and was battling it out for 7th position when the safety car came out. The safety car left the circuit wit 1 lap to go in the race. Reece took the inside line on turn 1 for an overtake but was cut off. Both cars went in to turn 2 with too much speed and hit the dirt leaving them at the back of the pack for the start of race 3. We are very pleased that Race 3 saw us come home with a strong finish. Ryan and Reece drove exceptionally well and landed themselves in 8th and 9th position respectively. A top ten finish for the both of them was definitely a result to be proud of. It topped off what was overall a great weekend. There are exciting times ahead considering where we are right now and how much we have achieved over the last couple of months. We have only just begun our journey. There is still so much potential for the cars, for Ryan and Reece as drivers and for the team as a whole. A huge thanks goes out to our sponsors Lynns Removals & Storage, McVey's Transport Ulladulla, EmbroidMe Penrith, Signarama Surry Hills and Wishart's Paint Solutions.